Doilfeoir, draíodóir, éachtóir agus éalú-eolaí ab ea Harry Houdini. Rugadh faoin ainm Erik Weisz (leagan eile: Ehrich Weiss) é i mBúdaipeist san Ungáir ar an 24 Márta 1874, agus d'éag sé ar an 31 Deireadh Fómhair 1926. Giúdach Ungárach ab ea Ehrich Weisz, agus chuaigh sé ar imirce go Meiriceá in éineacht lena thuismitheoirí agus lena chuid deartháracha nuair a bhí sé ceithre bliana d'aois. Shocraigh an teaghlach síos in Appleton i stát Wisconsin, áit a raibh a athair ag obair ina raibí. B'éigean don teaghlach aistriú go Nua-Eabhrac nuair a bhí Ehrich ina dhéagóir. Bhí Ehrich ag cleachtadh ealaíona éagsúla sorcais ó bhí sé óg, agus sa bhliain 1893, chuir sé suim sa doilfeoireacht agus sa draíodóireacht. 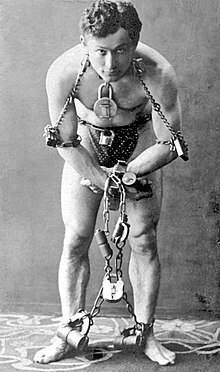 B'ansin a thosaigh sé ag tabhairt Harry Houdini air féin. Bhí a chuid cairde ag tabhairt "Harry" air le fada - bhí sé ní b'fhusa le fuaimniú ná "Ehrie" - agus fuair sé an sloinne ó Jean Eugène Robert-Houdin, doilfeoir Francach a mhair sa naoú haois déag. Ar dtús, bhí sé ag cleachtadh cleasanna cártaí den chineál thraidisiúnta, ach ní raibh mórán ratha air san obair sin. Nuair a chuaigh sé le héalú-eolaíocht, áfach, d'éirigh leis go gleoite. Sa bhliain 1893, casadh bean óg, Bess Rahmer, air i gConey Island, a bhí ina healaíontóir stáitse chomh maith leis féin. Phós sé Bess, agus bhí sí ina cúntóir stáitse aige an chuid eile dá shaol. Ar dtús, ní raibh ag éirí le Houdini, ach sa bhliain 1899, casadh Martin Beck air, fear mór ilsiamsa ag an am. Chuaigh éalú-eolaíocht Houdini go mór i bhfeidhm ar Beck, agus mhol sé don ealaíontóir gan bacadh ach leis na héaluithe feasta. Go gairid ina dhiaidh sin, bhí Houdini ar a chamchuairt sna tithe ilsiamsa ar fud na Stát Aontaithe agus, sa bhliain 1900, san Eoraip féin. "My Two Sweethearts" - Houdini lena mháthair agus a bhean chéile, t. 1907. Tugadh "Rí na nGlas Lámh" air, agus thaispeáin sé a chuid cleas sa Ghearmáin, i Sasana, in Albain, san Ollainn, sa tSualainn agus sa Rúis féin. Ba nós le Houdini dul i dteagmháil leis na póilíní áitiúla agus iarraidh orthu é a ghlasáil isteach sa phríosún, ionas go bhféadfadh sé éalú a dhéanamh. Sula ndúnfaí an doras air, dhéanfaí corpchuardach air le féachaint chuige nach mbeadh gléas a shaortha féin aige. I Moscó dó, d'éalaigh Houdini as vaigín iarnróid a bhí ceaptha le príosúnaigh a thabhairt go dtí an tSibéir. Bhí an t-airgead ag tonnadh isteach, agus d'iompaigh Houdini ina thoicí. Níor náir leis a shaibhreas nua a thaispeáint don tsaol mhór. Cheannaigh sé culaith a bhí déanta le haghaidh na Banríona Victeoiria féin, mar a deirtí, agus bhronn sé ar a mháthair féin í. Cheannaigh sé teach mór i Harlem freisin. Nuair a thosaigh an lucht féachana ag éirí gann, agus na héalú-eolaithe eile ag déanamh aithrise ar a chuid cleas, b'éigean do Houdini smaointí nua a fháil. D'éirigh sé as cleas na nglas lámh, agus d'oibrigh sé amach dóigheanna eile lena éalú-eolaíocht a thaispeáint. Go tipiciúil, ba é an bunsmaoineamh ná go rachadh sé isteach i gcillín beag a bhí á líonadh le huisce de réir a chéile. Ba é an Cillín Síneach Uisce (an Chinese Water Torture Cell) an leagan ba mhó le rá den chleas seo. Chrochfaí Houdini bun os cionn i gcillín beag agus an t-uisce ag dul in airde istigh ansin. Thosaigh sé ar an éalú seo a chleachtadh sa bhliain 1912, agus chaith sé an chuid eile dá ghairmréim i mbun an chlis seo, go bunúsach. Cleas dainséarach go leor a bhí ann, nó chaithfeadh Houdini stad den análú ar feadh trí nóiméad. Chreid a lán daoine go raibh cumhachtaí osnádúrtha, neamhshaolta ag Houdini a ligfeadh dó a chuid éaluithe a dhéanamh, agus glacadh buntáiste ar an gcreideamh seo le lucht féachana a mhealladh isteach. Níor thug Houdini féin le fios riamh, áfach, go mbeadh cumhachtaí den chineál seo aige. A mhalairt ar fad, fear mór sceipteachais a bhí ann. Nuair a bhí "meán" spioradachais éigin ag tabhairt le fios go raibh sé ábalta comhrá a choinneáil leis na mairbh, chaithfeadh sé a bheith cúramach nach dtarraingeodh sé súil Houdini air féin, nó ba ghnách le Houdini a thaispeáint don tsaol mhór nach raibh a dhath thar an ngnáthdhoilfeoireacht i gceist le daoine den chineál seo. Bhí Houdini mór le hArthur Conan Doyle, an scríbhneoir a chruthaigh carachtar Sherlock Holmes, ach ós rud é gur fear mór pisreog a bhí i gConan Doyle a chreid go macánta sa spioradachas agus sna cumhachtaí neamhshaolta, d'éirigh eatarthu sa deireadh, ar chúiseanna saoldearcaidh. Chuir Houdini spéis sna heitleáin freisin, agus bhain sé triail as an eitleoireacht sna blianta 1909-1910. Sa bhliain 1910, thug sé a eitleán leis go dtí an Astráil, agus bhí sé ar an gcéad duine ar éirigh leis eitilt chumhacht-thiomáinte a dhéanamh san Astráil gan a eitleán a bhriseadh ag tuirlingt dó. I ndiaidh an turais go dtí an Astráil, áfach, d'éirigh sé as an gcaitheamh aimsire seo. Fuair Houdini bás sa bhliain 1926. Nuair a bhí sé ag tabhairt cuairte ar Ollscoil McGill i Montreal, dúirt mac léinn darbh ainm J. Gordon Whitehead leis gur chuala sé nach ndéanfadh buillí láidire sa bholg a dhath do Houdini. Ní raibh d'am ag Houdini é féin a ullmhú do na buillí, nuair a thosaigh Whitehead á ghreadadh sa ghoile. Ina dhiaidh sin, thosaigh an goile ag luí ar Houdini, agus buaileadh breoite é le haipindicíteas. Nuair a réab an aipindic aige, fuair sé bás. Is dócha, áfach, go raibh aipindicíteas air sular casadh Whitehead air. D'éag Houdini in Ospidéal na nGrást i nDetroit, Oíche Shamhna, sa bhliain 1926. hAdhlacadh é in Queens, Nua-Eabhrac, ceithre lá ina dhiaidh sin. Bhí deartháir ag Houdini, Ferencz Dezsö Weiss, a bhí ina éalú-eolaí chomh maith. Rinne a mhuintir "Dash" den ainm Ungáirise sin Dezsö, ach sa deireadh, thug sé Theodore air féin. (Níl gaol ná lúb ghaoil ag an ainm sin "Theodore" le ceachtar den dá ainm Ungáirise a bhí ar Hardeen ó thús, nó is foirm Ungáirise de "Proinsias" é "Ferencz", agus is é "Desiderius" is bunús le "Dezsö".) "Hardeen" nó "Theodore Hardeen" an t-ainm stáitse a bhí ar Theodore. Bhí Theodore ina chúntóir stáitse ag a dheartháir sular phós Harry agus Bess, ach ina dhiaidh sin féin, bhí an bheirt deartháracha an-mhór le chéile. Bhí Hardeen féin ina éalú-eolaí, chomh maith le Houdini, agus uaireanta, chuaigh an bheirt ar an stáitse in éineacht. Tugadh an leathanach seo cothrom le dáta an 16 Meitheamh 2017 ag 20:25.